Park Slope. Home to sprawling Prospect Park, Mom’s and Mommy Bloggers, the uber-wealthy and up-and-coming, but most importantly – filled from Fourth to Flatbush with great eats and booming with burgers. Through the past few years, in tandem with the expansive gentrification of the neighborhood, we’ve seen notable best burger in New York contenders in 67 Burger (a 2011 NYWFF Burger Bash entrant), Burger Bistro, and the ever-popular Bonnie’s Grill grace the pages of our favorite burger publications and forums. 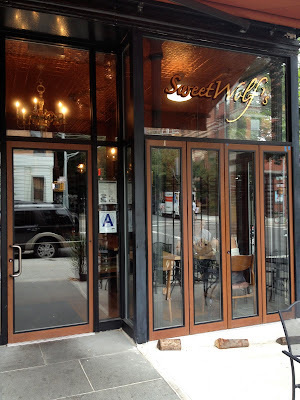 While regrettably to date we’ve yet to venture to Park Slope for enough tastings at the preceding locales, we were fortunate to mosey over to a more recent contender in Sweetwolf’s. 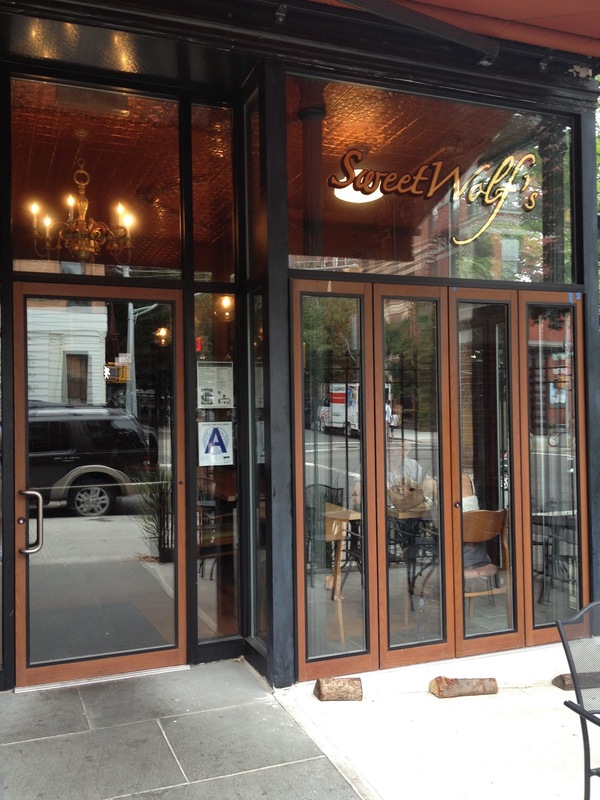 Situated on a subdued corner of Sixth Avenue, brick-walled and warm, we got a chance to find out what owner Eric Wolf was made of after hearing the swirling sounds of supremacy from various readers. Serving up a mature menu chalk full of comfort food, draft beers, and a staple burger, our carnivorous appetites pre-approved. 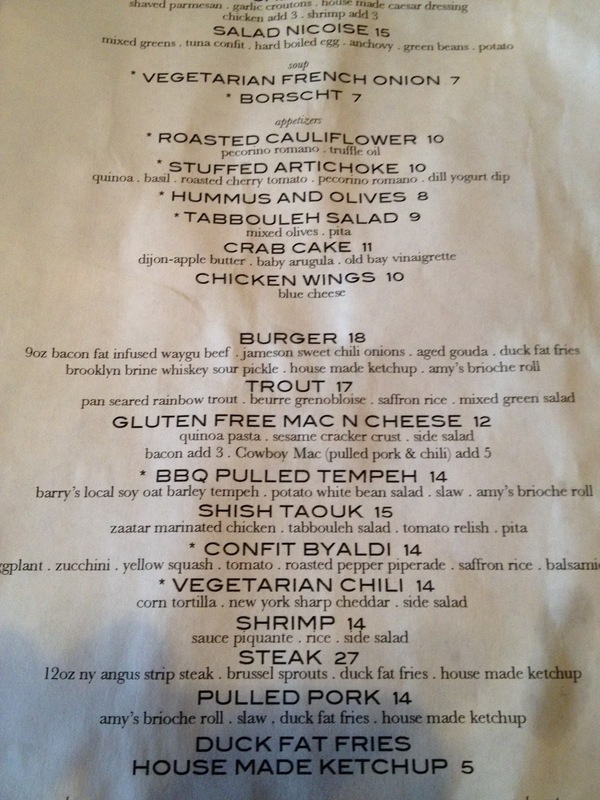 Our Expectations: Bacon Fat Infused Burger? Yes please. Nine ounces of bacon fat infused Wagyu beef, Jameson soaked sweet chili onions, and aged Gouda – all on an Amy’s Bakery Brioche bun. Accompanied by house made ketchup and a Brooklyn Brine whiskey sour pickle – Mr. Wolf is nothing if not a menu-wielding poet. Certainly a few firsts in and on this burger that tantalized our taste-buds via literary prowess. Meat: Bad news first. The meat was a bit overcooked, with a medium rare order coming out slightly above medium – that’s a little hard to forgive. Maybe with such a large hunk of meat the task is a bit tough? 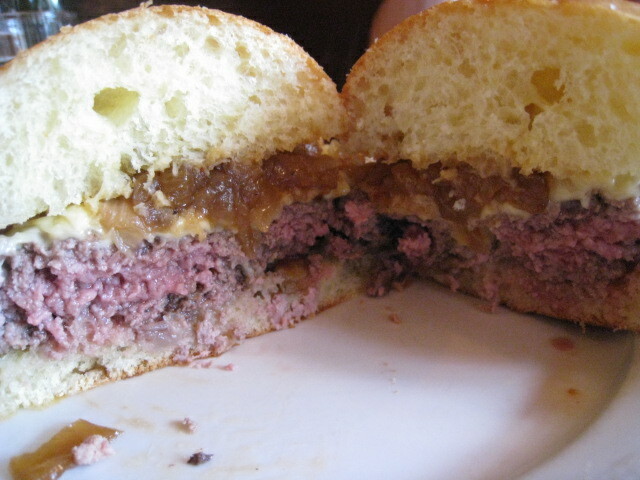 Moreover, taking a bite consisting of just beef uncovered a somewhat under-seasoned patty, lacking salt. Now, the good news. While the preceding flaws existed, one can only imagine what a medium rare cook would have yielded as the patty was STILL juicy and tender. Must have been the bacon fat – pure gluttony and almost a show-stopper. We loved every damn bit of the composition and the outer char provided an additional layer of smokiness from the wood-fire oven Sweetwolf’s is home to. Toppings: Jameson usually tops our whiskey rocks on weekends, not our burgers. Alas, Sweetwolf’s douses their onions in the 80 proof Irish original. Sounds like a win, no? You won’t hear us complain, much, as it made for a sweet and tasty topping. That sweetness though, a touch overpowering. Regardless, when paired with creamy aged Gouda hailing from Netherlands, it was solidly counterbalanced. The Gouda itself was a little under-prepared as only half of the cheese wrapped the patty, while the other half wasn’t yet melted. Sticking points, we know. Nevertheless, when’s the last time the Dutch and Irish got together for a burger? Maybe it didn’t go as perfectly either. Bun: Amy’s Bakery doesn’t dare disappoint with a fluffy and fresh resting place for the 9 ounce burger. Quite sweet but not distracting, we enjoyed it so much we could’ve eaten it solo, toasted it, and slathered some butter on there. Meat (43): Steady that cook and we’ve got more points. The overdone center irked us but the amazement of the bacon fat goodness and wood-fire smoke won us over. 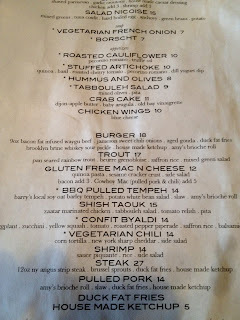 Toppings (21): Whiskey on rocks, yes. Whiskey on onions? We’re fans as well. 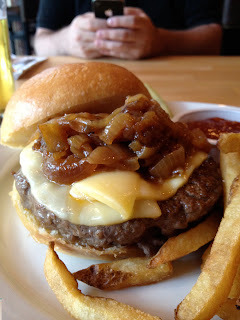 Gouda is a newcomer to our best burger in NYC search but we welcomed it with open mouths. Though, we missed a bit of “crunch” from this section. Bun (23): Perfect ratio, beautiful glaze, and while a tad too sweet it was legitimately tasty. We’d take some to go.